Tales of a summer with a 91 (now 95!) year old: This cat has gotta go! This cat has gotta go! 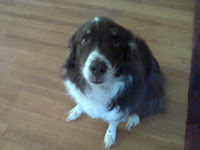 So, I'm sitting here in the living room, writing another eHow (yes, still at it...) and I hear a 'thud' in the kitchen. Now, I know it's not Mom as she's upstairs taking a nap after her shower so I'm sitting here thinking, 'What dog did that....' No sooner did the thought surface than Killian came flying into the living room to me. If he had a tail, it would have been between his legs. He was all but crying. I laughed out loud as his ears were back, his eyes a bit wild. I think he thought he was about to get it and I believe he was running to tell me he didn't do it (for once).